Back to School for Grown Ups is a selling exhibition of highest calibre handmade leather goods, books and pens. A celebration of a new academic year for design conscious adults. MacGregor & Michael, leatherware designers, Ursula Jeakins, book binder and guest exhibitor, Jake Lazzari, pen maker, will be showing their exceptional craft in this school themed project. A workshop / bindery will be set up in the window of The Guild at 51 so that Val Michael and Ursula Jeakins can demonstrate their crafts. Ursula will also be running daily workshops at Chapel Arts, just down the street, from the 10 – 15 October. Jake Lazzari is a designer maker who trained at the Hereford College of Arts. He produces intricate work which reflects his lifelong interest in architecture, science fiction, design and industrial mechanics. His one off contemporary pens are inspired by the lavish Italian cycle components that he encountered while working in the bicycle industry. Jake will be making a collection of at least six pens for the exhibition. All the pens are handmade in Ebonite, which is a traditional material for pens, developed originally to replace expensive ebony wood and as an alternative to metal pens. 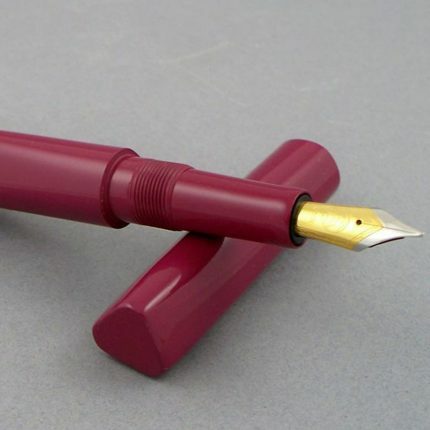 All Jake’s pens use Bock German nibs which are regarded as some of the finest on the market. Ursula Jeakins works as a traditional stationery bookbinder, making books of all shapes and sizes for writing, drawing and other forms of documentation. 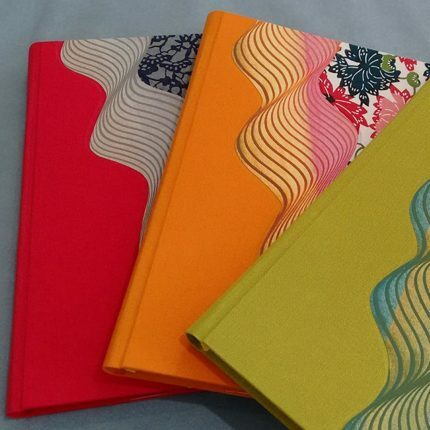 Each book is made completely by hand and structures vary according to the use of the book. Ursula has a love of English patterned papers, from the 1930s onwards, which has led her to make bespoke collections for museums, tying in with exhibitions relating to particular artists. In addition, Ursula imports and collects hand-decorated papers, and makes her own decorated paste papers. MacGregor and Michael make a range of leather goods using only the best quality vegetable-tanned leathers sourced from the UK and Europe. Their designs aim to reveal the unique qualities of leather and the value of craftsmanship. Over the years they have fine-tuned their skills through a combination of experience, experimentation and research. Always willing to explore challenging design ideas, everything is made by hand, including the stitching and each piece is individually made to the highest standards using leathers, threads and metal fittings which complement the work. 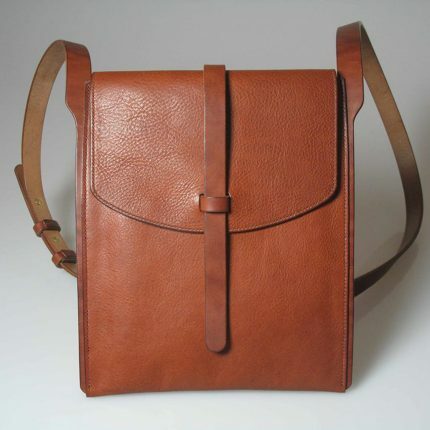 For this exhibition, MacGregor and Michael will be making shoulder bags for men and women suitable for books, laptops and iPad type devices, a music case style briefcase, and pen and pencil cases and trays. Back to school provides some fun at the start of a new school year. Why shouldn’t adults need beautiful new kit for the autumn term? The window of the Guild at 51 will become a workshop/bindery space for the duration of ‘Back to School for Grown Ups’. Come and see three of the exhibitors; bookbinder Ursula Jeakins and leatherworkers Neil MacGregor and Val Michael, demonstrate their craft.